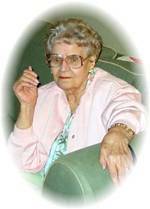 Cecile L. Ferguson, 94, of Houston, died June 8, 2005, in Mariner of Cypresswood in Houston. Mrs. Ferguson was born April 24, 1911, in Brookland, Arkansas, to Odus and Josephine McFarland Johnston. She was baptized and grew up in Kiefer, Oklahoma. On Feb. 5, 1936, she was married to Raymond W. Ferguson in Tulsa, Oklahoma. Mrs. Ferguson was a homemaker. She was a longtime member of First Baptist Church of Bellaire and Calvary Baptist Church of Brenham. She was also a past president of AARP, Brenham Chapter. Survivors include two sons and one daughter-in-law, Donald R. Ferguson of Los Angeles, California and Norman L. and Heidi Ferguson of Houston; three grandchildren, Thomas L. Ferguson and wife Beth, Michelle D. Ferguson and James M. Ferguson; two great-grandchildren, Makenzie J. Ferguson and Connor L. Ferguson; and one brother and sister-in-law, Floyd L. and Virginia Walker of Tulsa, Oklahoma. She was preceded in death by her parents; and her husband, Raymond W. Ferguson. The family will receive visitors from 6:00 to 8:00 p.m. Friday, June 10 in Memorial Oaks Chapel. The funeral service will be at 10:00 a.m. Saturday, June 11 in Memorial Oaks Chapel in Brenham with Larry Embry and Bob Craig officiating. Interment will be in Prairie Lea Cemetery in Brenham [Washington County, Texas]. Pallbearers will be Lonnie Landgraf, Buddy Gambill, Calvin Boecker, Don Shaw, Sid Sidenblad and Junior White. Funeral arrangements are entrusted to Memorial Oaks Chapel, 1306 W. Main St. in Brenham.